You remember those yorkers. Those fast, swerving yorkers that Mitchell Starc unleashed in Auckland and Melbourne against New Zealand, the defining deliveries of the 2015 World Cup. You remember them more than you have witnessed them lately, because Starc hasnt been able to produce them too often for a while. 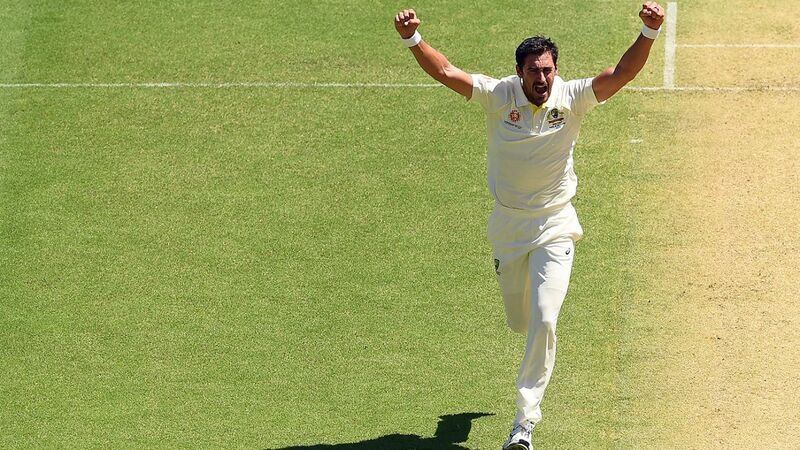 In the aftermath of Australias first home-Test day for the summer, Starc revealed how he and the bowling coach David Saker had been working to rediscover the sort of swing and pace he showcased three years ago. As a result, he has got the new ball swerving more consistently in Adelaide, both the nets and in the middle, than he has since that tournament. Central to their work has been to get Starc bowling in a more upright manner over a braced front leg. Over the course of several years and even more wear and tear to foot and leg, Starc realised that he had been collapsing that leg in trying to avoid soreness and pain. Fully fit after a natural recovery from his most recent foot injury in South Africa earlier this year, Starc was swinging the ball sharply in training ahead of this Test, and on day one gained enough shape to make his angled ball across the right-hander too dangerous for M Vijay to ignore. "We had a bit of a chat a few months ago now prior to the UAE tour about how my action had probably changed, bowling through niggles and periods where Id been sore and that sort of stuff," Starc said in Adelaide. "There were times when Id collapse on my knee to try to get through when I was sore and that sort of thing. "So going back to perhaps as I bowled in the World Cup in 2015, I got the ball swinging around and bowling with good pace. So it is something Ive tried to find a way to get back to. There werent any big differences or big changes I had to make, but little things Ive been doing in the last few weeks seem to have found a bit more swing I think." For all the work he had done, Starc acknowledged that gaining swing can also be something of a mystery in terms of its consistency. He is now hopeful, however, that the sort of curve witnessed in Adelaide can be sustained through the remainder of the summer. "Ive been sort of tweaking a few things and trying a few different things with David Saker, looking at perhaps how I bowled in 2015 throughout that World Cup and trying to perhaps get over my front leg a bit more. Little things have worked and hopefully the swing that Ive got the last couple of weeks hangs around for the summer," he said. "Theres little things Ive tried over the last little while that have worked for little periods. This one seems to be working for a bit longer, I had it going nicely in the nets the other day and its worked again today. "Just little changes and little cues I used to have that I probably went away from or unknowingly went away from. But its nice to see the ball moving around and I think weve all been preparing brilliantly for this Test series with a little period off after the [previous] Shield game. Between the batters and bowlers our preparations been fantastic, so its one good day out of a long series, so hopefully personally I can keep swinging the ball around and being that bit more consistent than I have been in the past." Assessing the day as a whole, Starc reasoned that the Austrlaians had been very close to their best for the first four hours of play, before flagging somewhat after tea on what was an oppressively hot day. "I think weve planned and prepared really well for this week and had a lot of vision to look at, and how India have played in the past," he said. "They did go quite hard but we bowled exceptionally well for the first four hours, especially when the ball got soft and stopped moving around, the scoreboard never got away from us. "I thought we bowled really well for four hours, probably pretty well for another hour and probably got it a bit wrong at the end there. [Cheteshwar] Pujara batted a lot of time, hes someone who likes to absorb pressure and bat a long time, and credit to him he scored a fantastic hundred today. I think if you asked us at the start of the day if wed take losing the toss and [India] being 9 for 250 at stumps I think wed bite your arm off." As for the stunning one-handed catch claimed by Usman Khawaja to claim Virat Kohli in Pat Cummins first over of the day, Starc noted how much the Queensland captain had worked on his fitness and agility in 2018. "Usman Khawaja 3.0 isnt it?" Starc quipped. "No hes on fire, hes made a huge effort over the last nine months and its showing in his batting and now its showing in his fielding. A great catch and probably one hell keep bringing up now as well, so a great effort from him."